I don’t know about anyone else but I absolutely love pizza, if I go to a restaurant and it’s on the menu then 99% of the time I will have to order it. But I’m incredibly fussy about the topping I like. I will only eat pizza with these toppings; any kind of cheese, tomatoes, spinach, ham, egg, tuna, ham, rocket or bacon. I’m sorry but if a pizza has any other ingredients added I will certainly be picking it off. Which inevitably causes problems as I end up with greasy fingers and cheese under my nails. To try and combat this problem, Fi and I have been trying to move away from ordering take away pizzas. Instead we’ve been making our own pizza dough, which allows us to create our own individual pizzas and feel less guilty about the number of calories we’re consuming, because let’s be honest, a homemade pizza isn’t going to be as bad for you as a shop bought one. It’s also become a staple dinner option when we’re catching up with friends. So, on that note, here is the recipe that we use. Makes 4 individual pizzas. Mix the yeast with the water and add the oil. Put the salt and flour into a large mixing bowl. Add the wet ingredients to the bowl of dry ingredients. Mix together to form a dough. Turn out onto the work surface. The dough can be quite sticky at this point so make sure you sprinkle flour on the surface. 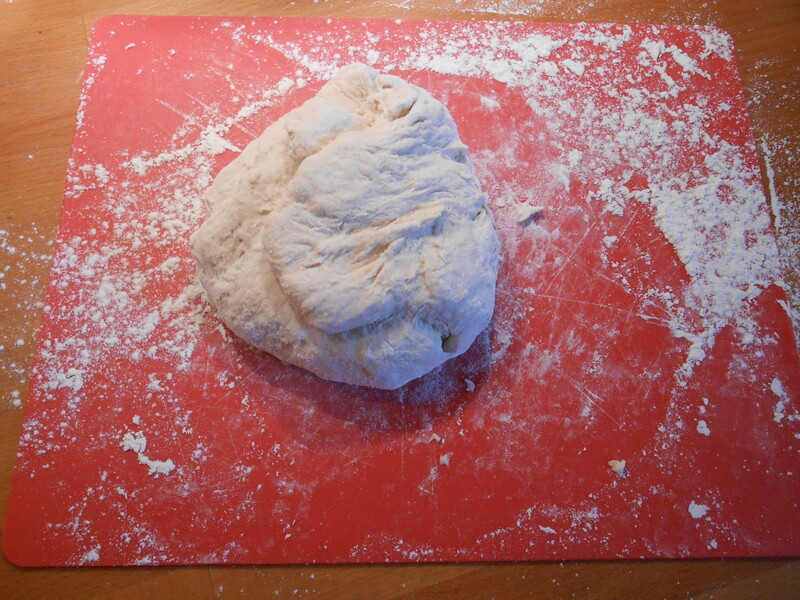 Knead the dough for about 10 minutes, or until it’s stretchy and smooth. Place into an oiled bowl and cover with cling film and leave to rise for 90 mins in a warm place. We like to leave this in the fridge over night instead, so we always make it the night before we need it. Once risen divide the dough into four pieces (or into however many pizzas you want to make) and start to flatten out, honestly I’ve found that it’s easier to shape it with my hands, but if you’d prefer to roll it out with a pin then go that way. 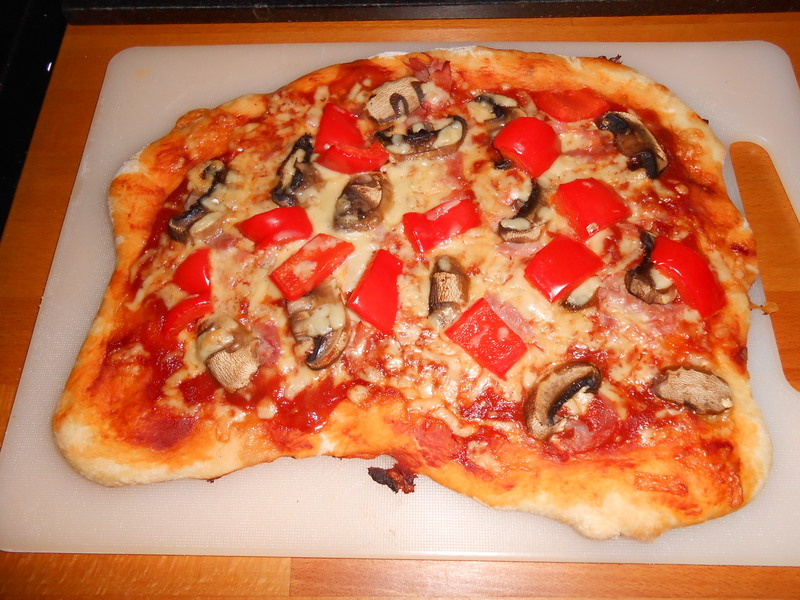 Once you’ve got your desired thickness, start to compile your pizza. In our flat, this means liberally spreading the base with a tomato sauce. We use either our homemade tomato sauce (recipe to come soon) or a basic pasata from the cupboard. Next add your cheese and other toppings. This is where you can get adventurous – I’ve seen people add everything under the sun to their pizza while others are satisfied with just your basic mozzarella and tomato. That’s the beauty of making your own pizzas no arguments over toppings or eating something that you don’t really want. So get your aprons on and start experimenting with base thickness and toppings. Let us know what your favourites are. Also keep an eye out for our homemade tomato sauce recipe coming soon.